When Ray was teaching University-level design courses in creative thinking, he loved utilizing a textbook entitled The Universal Traveler. It broke creative problem-solving and creative thinking into 7 energy states. The first state was ACCEPTANCE. To accept a problem means to assume its responsibilities which need to be done with an adequate level of energy and commitment. Often you need to kickstart things to get them rolling. Most people, and especially students, do this start-up state very poorly. I cannot imagine there are many reasons as weak as "the teacher told me to do it." So, the option is to make achieving the solution essential to your life. Declaration of Acceptance is one of 15 strategies explained in the book for successfully following through on state 1. It instructs you to seriously declare your intentions to a person or persons whom would be significantly disappointed if you didn't follow through to give you an extra push to jump off the high board into the pool. The workshop's focus is to make a typographic postcard that can be given away or sent to friends as your personal "Declaration of Acceptance" to start 2018 off with a billboard-sized bang. We tried to step into the workshop with no fear of the challenge we were undertaking, but to just try to excite us to the opportunity. We also decided we liked 6" x 4" cards. The plan is to set the cards up for one color and run at least about 50 of them for everyone taking the workshop. Address them to people who will be excited about your goal and disappointed if you don’t at least try hard to get there. Slap a stamp on it and let the Postal Service do the rest. The image at the top is Ray's card from this workshop in 2018..
After Ray's recent success collaborating with his former colleague, Martha Carothers, it seems reasonable to give it another shot. Ray wants to take the idea for his book, "How Ink Writes Poetry," to a new level where he could convince amazing people to collaborate with him. A bit of thinking leads him to use each new edition of the book to bring more rare people into the collaboration with the end goal of the 5th editions to connect with Stephen Hawking writing the text. To be clear, the actual thought that he could get Stephen Hawking to write text for his book is about as easy to accomplish as world peace. But then there is no reason not to give it a try. Turns out that 4 days after these were mailed out Stephen Hawking passed away. Not to fear. There is someone else just as unobtainable to try for. The point of "acceptance" is to get you move past the negative reasons to not do something and move you into the positive ones. 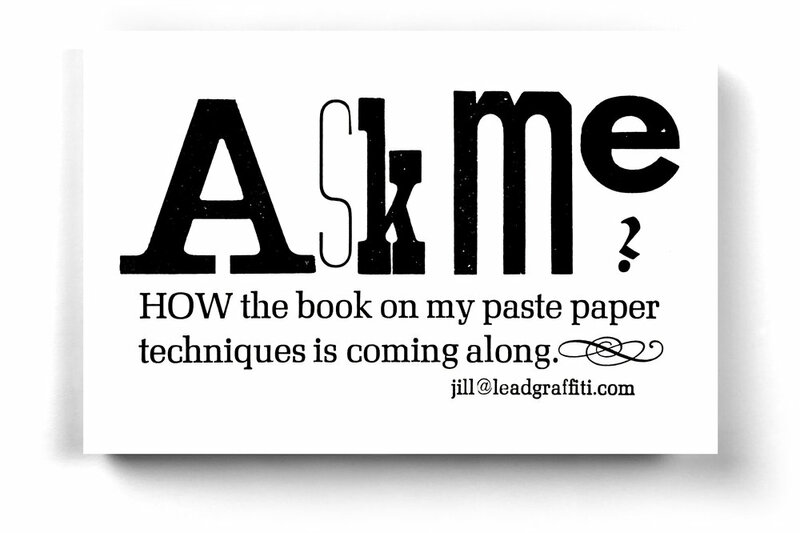 Jill wants to do a book series, each with up to 10 samples of her paste paper and an explanation of the technique for accomplishing each. Love the call to action that comes from asking a point blank question. 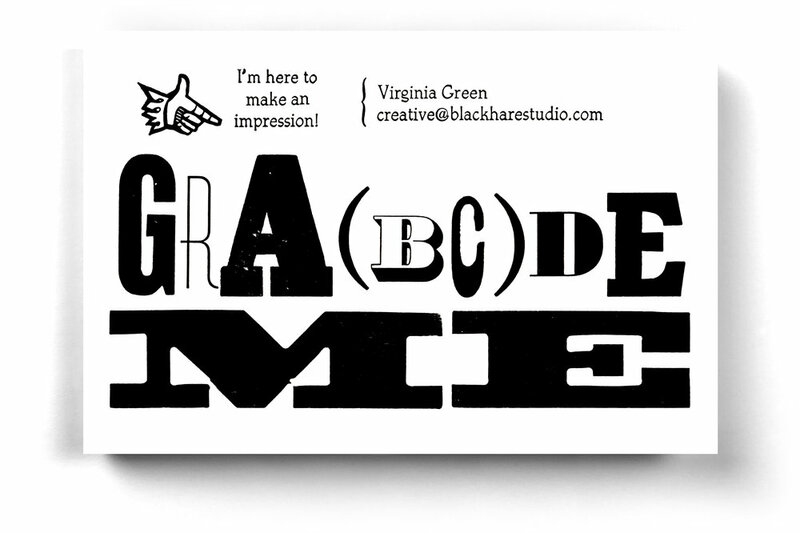 Virginia was headed to the CBAA conference and thought a card that got her noticed might help get some interesting conversations started. With her being a teacher at Baylor University, and with grading as a natural component, the fact that "grade" had that AD in it opened up an excellent way to get to the A-B-C-D grading system suggested by the card.